The Simons family continued to live at Langar for centuries, and later for a brief time in Knipton. On our trip, we stayed at the present-day Langar Hall, a charming country inn presided over by a most welcoming and delightful owner, Imogen Skirving. 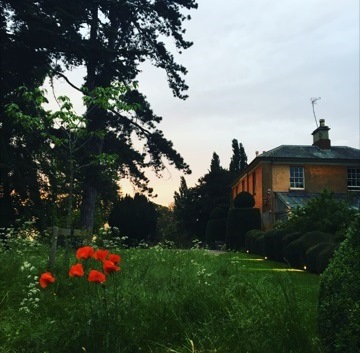 Langar Hall has an assortment of lovely guestrooms, all decorated in traditional style – including one named after a frequent guest, the late novelist Dame Barbara Cartland – overlooking views of the gardens and, beyond, vistas of the Vale and its wide, green fields and gently rolling hills. Today’s Langar Hall is a fine country house, pictured here, and is separated by only a few feet from the church at Langar where generations of our ancestors were parishioners and where many are buried alongside the Scropes and others. In the following days, we explored numerous villages and hamlets associated with our ancestors, including Knipton, Muston, Stathern, and others. The most memorable part of our trip occurred during our visit to Belvoir Castle, seat of the Duke of Rutland – a majestic “fairytale” castle with high turrets, perched high atop a hill amidst a sweeping Capability Brown garden landscape. At the castle, a trove of genealogical surprises awaited us. Our Simons ancestors had long been associated with, and in service to, the Manners family, Earls and then Dukes of Rutland. The present Duke, an avid historian and author of a forthcoming naval history set during the Revolution, had learned of our visit and taken an interest in it, and he graciously invited us to lunch at the castle. 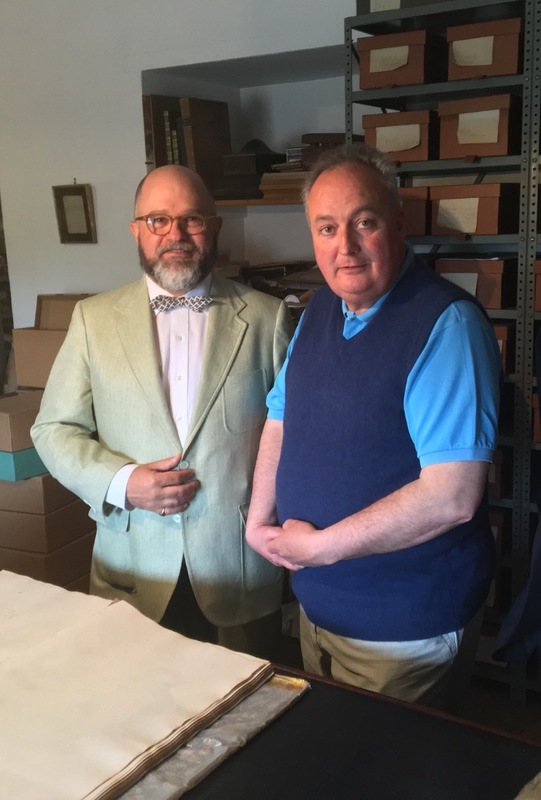 The archives at Belvoir Castle: Brenton Simons and His Grace the Duke of Rutland. What we did not expect was that he had also arranged, through the assistance of his aide-de-camp, the Reverend Stuart Foster, and archivist, Peter Foden, to show us records of our ancestors from the extensive Belvoir Castle archives. We arrived at the castle at the appointed hour and our jovial hosts proceeded to conduct a full “Who Do You Think You Are”-style experience for us, showing us numerous original records of our ancestors heretofore unknown to us. The most revealing discovery was that an earlier Duke of Rutland had given my ancestor ten shillings to help pay for his emigration to America. That struck a chord. Through our visit in 2016 to “hallowed ancestral grounds,” our family had now come full circle, and had done so as guests of the descendant of the man who helped our ancestor reach American shores. Motoring out in the 1908 Renault. His Grace the Duke of Rutland, center, and top, left to right, Rev. Stuart Foster, Herbert Simons, and Brenton Simons. The discoveries continued. Having pinpointed an ancestral home in nearby Stathern, the Duke drove us down to take a look at a handsome whitewashed house that belonged to my ancestor, Edward Simons. Other surprises were in store for us. 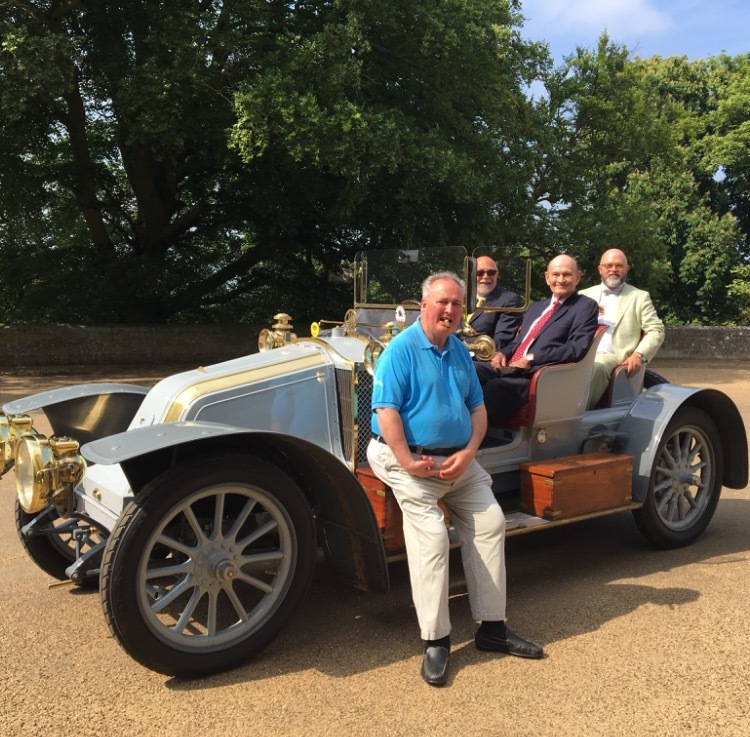 After a delicious lunch and much good conversation, we ventured out in the Duke’s 1908 Renault. This grand old automobile, now more than one hundred years old, drove splendidly and whisked us to the Belvoir Hunt, a location on the Duke’s estate where we knew a more recent ancestor, Admatha Simons, had lived. 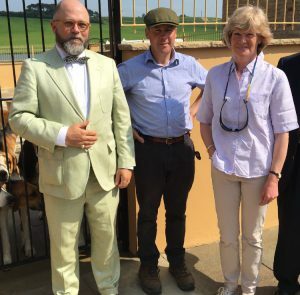 The Belvoir Hunt: Brenton Simons, John Holliday, and Lady Sarah McCorquodale. The following day, we visited Haddon Hall, home of the Duke’s brother Lord Edward Manners, considered to be one of the most romantic houses in England and a location of many films, including three different versions of Jane Eyre. 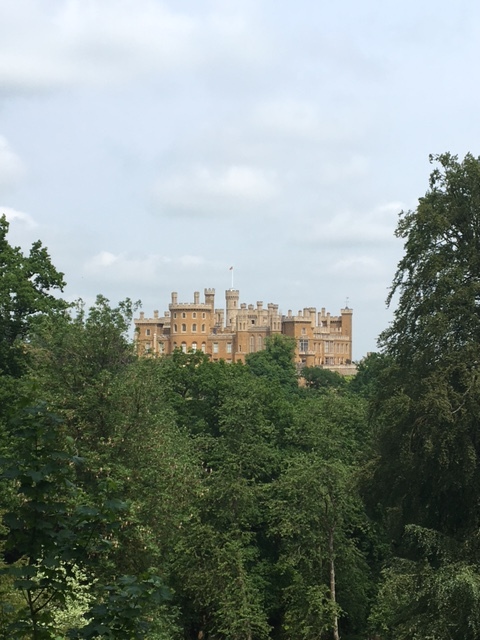 Our visit to Belvoir Castle was truly magical, and I hope to bring a group of NEHGS members there one day – to stay as guests in the castle itself and explore the historic surroundings – on a heritage tour. I know from firsthand experience, such a visit will be unrivalled for its rich exploration of history, extraordinary hospitality, exquisite artwork and architecture, rural scenery, and a range of country pursuits. In closing, one of my longstanding recommendations to our patrons over many years has been that beyond genealogical research conducted through records, we should all try to visit the locations associated with our ancestors – whether in the United States or abroad – and learn something of the history, culture, and scenery of the places where our forebears lived and worked, were born and died, and experienced all the joys and disappointments that every life brings. Our trip to the Vale of Belvoir carried out this advice for a branch of my family to whom we had never given much genealogical attention. Happily, it exceeded all our expectations. I hope by sharing this story I inspire at least a few of our members and friends to undertake similar family heritage trips, whether with NEHGS or on their own. 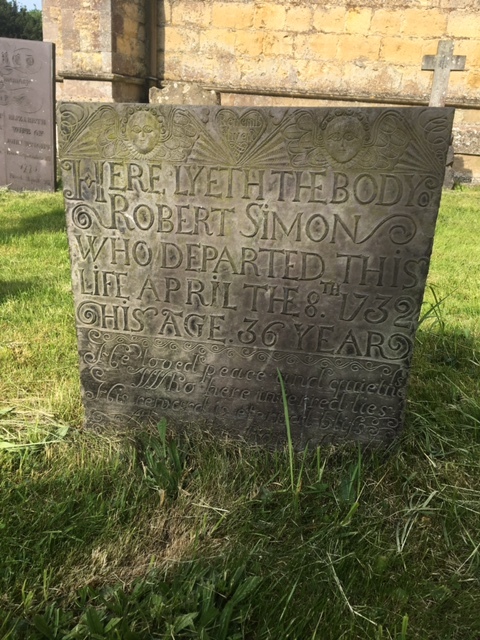 Gravestone of Robert Simon (d. 1732) at Langar. The Simons family especially wishes to acknowledge and thank His Grace The Duke of Rutland for making them most welcome at Belvoir Castle and permitting them access to records in the Castle archives. Brenton, What a wonderful story! I visited Belvoir Castle many years ago with my cousin, John Black – little did we know we were viewing some of your ancestral history as well. It would have pleased him to know that! It’s a beautiful part of England and we enjoyed our visit to the region very much. Topical, considering today’s events, which I am witnessing right now from London. Cheers! Thank you, dear friend. I am so interested to know you and John visited Belvoir. Wonderful! Truly a dream vacation. I am envious! Brenton – you might enjoy reading “The Secret Rooms,” by Catherine Bailey. It so wonderful you were able to share all this with your uncle. And gee, Brenton, knowing you is going to make my score skyrocket in any future game of “six degrees of separation” I play. This is a terrific story, Brenton, and a lovely way to celebrate your ancestors. Since I have Beever ancestry from Yorkshire, I just checked George Redmonds new book, “A Dictionary of Yorkshire Surnames,” where I see he made note of the possible connection of the Beever surname to Belvoir Castle, but as yet not a positive connection. I’ve added the Belvoir archives to my ToDo List! So glad you liked it, dear friend. I just had a glance at George’s wonderful new book last night. We hope to cover it in the magazine! What a wonderful visit you had in the Vale of Belvoir. I have made similar visits to ancestral homes in Northern Ireland, CT, MA, VT, RI, NY, PA, OH, WI, KS, OK, HI and CA following migrations of both paternal and maternal lines. England is on my list! The pleasure of meeting people who know of your people, their lives and times and the serendipitous things that surprise you are precious life memories. I recently returned from a visit to the home of my 4th Great Grandparents in Scotland. The current owner was very welcoming and had papers and artifacts to show us. In addition we found the gravestone of my 4th Great Grandmother in a nearby cemetery! It is an experience I will never forget. Many thanks for your interesting blog.